My Paint is Separating When Applied….WHY???? 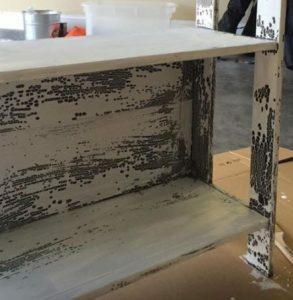 Has your paint separated within seconds after applying it to a piece of furniture? Often people immediately jump to that cleaner was left behind however, that is not always the case. I will often look at the whole piece. If it was the cleaner, it would typically cause the paint to repel all over or in random areas, versus only on some of the sections of it – and where the problem is, it covers that entire surface totally. So, if the sides of a piece are fine, and only the top or the front is having this issue, it most likely is based on the material used there. Think about it, often in the construction of furniture, multiple materials are used. Think how often end caps of kitchen cabinets are a composite but the cabinet doors are all wood. Sometimes certain materials – like laminate is coated with a topcoat that can cause the paint to separate. If I see this happening after my first brush stroke, I usually will wipe the paint off and lightly sand to scuff the surface. Sand in the same direction you plan on applying the paint or that the wood grain goes. Don’t waste your paint by having to use extra coats to get it to cover. 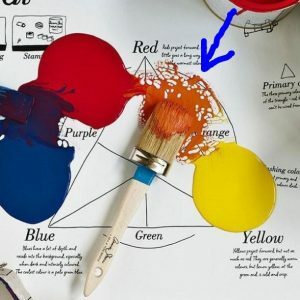 This issue may be more common when painting a piece from IKEA, or Target or …for me (The Purple Painted Lady®) – it was an old piece from The Bombay Co.
Another possibility from fellow Chalk Paint® stockist Gypsy Lovell shared that this could because the furniture is made with silica …..which is similar to Annie’s Mix Mat. Notice when you put paint on the Mat, it will also do this. To remedy this from happening- you can lightly sand it to scuff the surface. 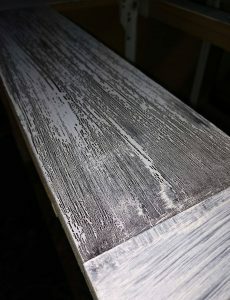 Sand in the same direction you plan on applying the paint or that the wood grain goes (if it has a wood looking surface). To fix the cheap pressboard furniture that may be causing this issue – you can also sand it lightly and put multiple thin coats of Chalk Paint® on waiting at least 12 hours between each. “For years now we have been recommending to a customer to first thoroughly sand their IKEA piece (and Formica too) to break the surface tension (unless it’s been finished with thermafoil, which cannot be painted). Then apply a thin coat of Chalk Paint®. Let paint dry and then wait 48 hours to allow the paint to bond. The Purple Painted Lady® recommends adding a little water to your Chalk Paint® also. No more than than 20%. So, if you have one cup of Chalk Paint® – take a 1/8 measuring cup and fill with water and add to the paint and mix well. Remember – you can always add more water- BUT don’t waste your paint by adding too much and making it too thin!